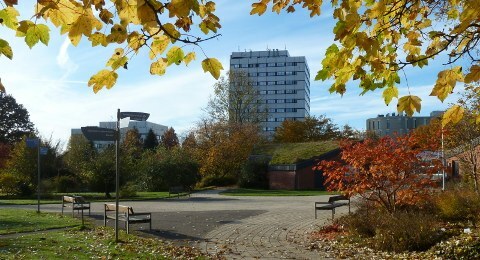 Bus routes 50, 60S and 81 to the terminus "Botanischer Garten"
To approach Kiel Botanic Gardens by private car, approach Olshausenstraße. Close to the junction Leibnizstraße, you will find the parking area "Bremerskamp". The parking area close to the Institute of Physics, opposite to the main entrance, is recommended for disabled visitors. You will find this parking area on the left-hand side at the end of Leibnizstrasse. On working days before 4 p.m., it might be necessary to ask for parking permission at the gate at the entrance of Leibnizstrasse. Alternatively, parking facilities are available along Neufeldtstrasse close to the Wissenschaftspark and Westring. In this case, please use the "Entrance Direction Westring". from the north from Steenbeker Weg via "Schwarzer Weg" that you will find directly beside the Lubinus Clinic. from the east (from the city centre) via Neufeldtstraße. At the end of this street, you have to cross a pedestrian bridge to reach the "Entrance Direction Westring". Alternatively, you can follow Olshausenstrasse und Leibnizstrasse directly to the main entrance. from the West and from Eckernförder Straße via Johann-Fleck-Strasse, Olshausenstrasse, and Leibnizstrasse. via the new Veloroute 10. Keep left at its northern end, cross the Olof-Palme-Damm by the bridge and follow the road to the main entrance. Bicycle racks are available directly infront of the main entrance and at the "Entrance Direction Westring".